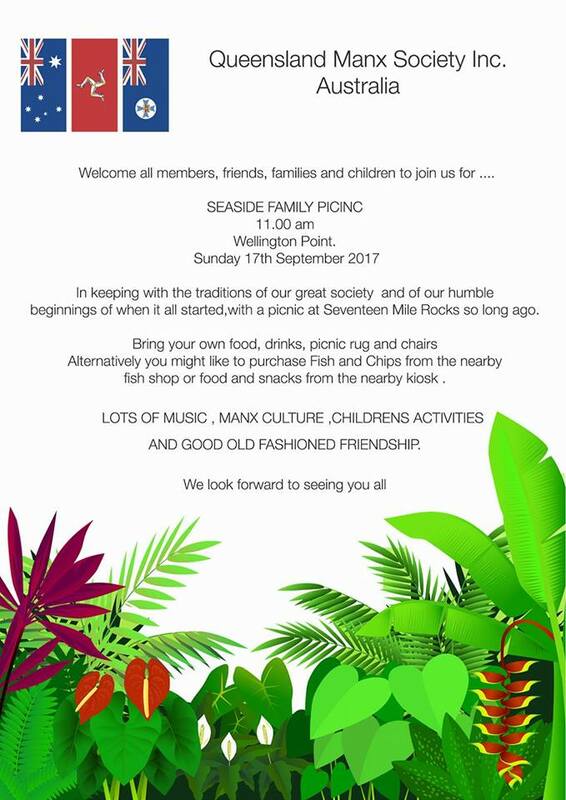 Up to date information about the Manx Family Picnic can be found on our Facebook Page (click the little Facebook icon on our home page). The Queensland Manx Society has made the decision to request people pay attendance fees prior to any functions or social activities they attend (where there is a cost involved). The specified amount should be paid into the QMS Bank Account at least one week prior to any such event (please eMail us on mannin@queenslandmanx.org.au to obtain the bank account details). Having said that, the Treasurer will maintain the service of accepting funds “at the door” immediately prior to functions in order to aid and support members and friends that do not have access to on-line banking. 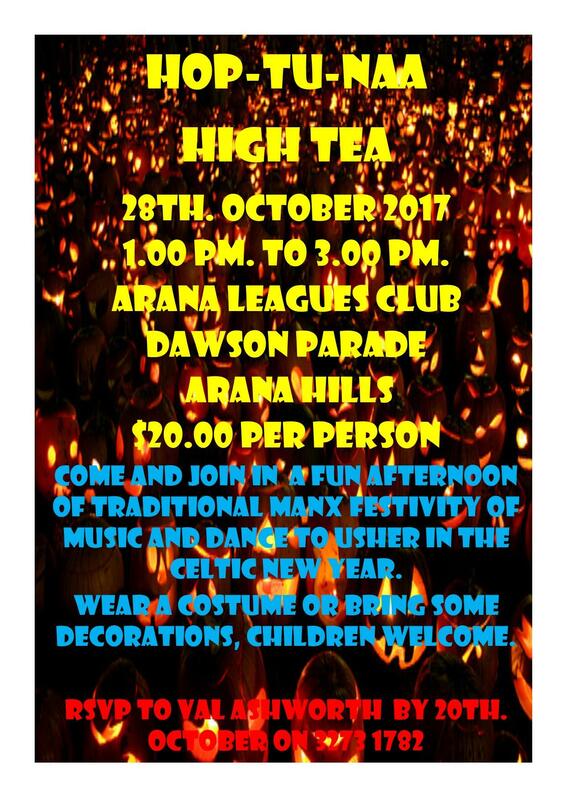 After 103 years of existence in Australia, the Queensland Manx Society Incorporated is about to celebrate Tynwald Day on 1st July 2017 at 11:00 am with a luncheon at the Arana Leagues Club, Dawson Parade, Arana Hills (Northern suburbs of Brisbane, Queensland, Australia). Tynwald Day is the National Day of the Isle of Man, originating over 1036 years ago during the occupation of the Island by the Vikings from the North. As a continuously serving parliament, the longest in the world, all laws are enacted at a ceremony on Tynwald Hill in the heart of the Isle of Man. The parliament is known as Tynwald which is presided over by the House of Keys. Any grievance or petition can be brought forward by citizens of the Island at this event to be heard by the members of the House of Keys. Her Majesty Queen Elizabeth, Lord of Mann, presides over these proceedings through her representative, the Governor. The ceremony begins with a church service at St. John’s Chapel at St. John’s and a parade of Members of the House of Keys and dignitaries move to Tynwald Hill for the presiding session, read out in Manx and English. All this is followed by a fair and dancing. Altogether it is a very auspicious occasion on the Isle of Man, so the Queensland Manx Society conducts an event to fit the nature of the occasion with a few toasts and words of support. 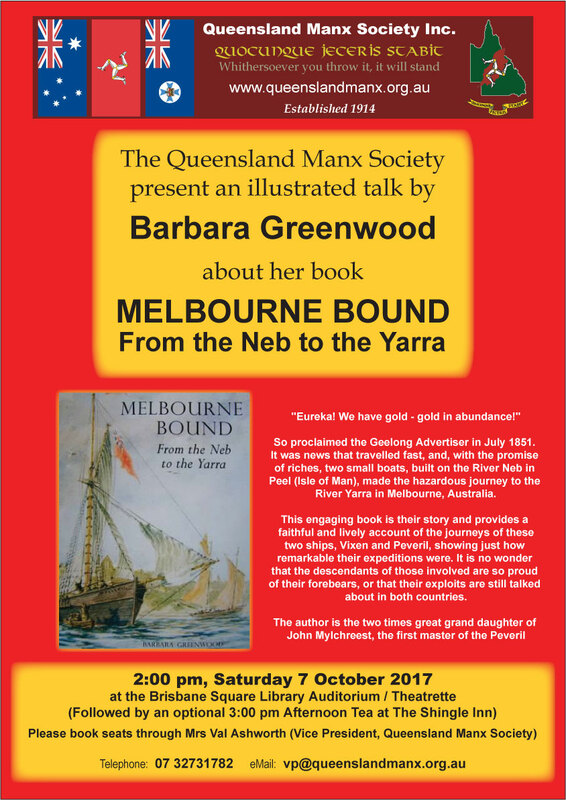 Kindred folk (of Celtic heritage, or those interested in all things Manx and/or Viking) are invited as well as friends of the Queensland Manx Society. In fact, anyone and everyone is welcome to join in and would be most welcome. Contact the Secretary – Val Ashworth on 07 3273 1782 (or email arashworth@optusnet.com.au) for details. Please RSVP no later than 20/06/17.